POL: Our Family's Heart by Jeanette Crews Designs, Inc. 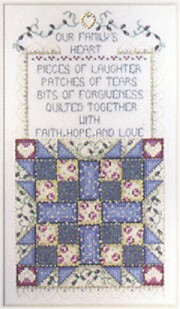 This pattern comes from the book Inspirational Treasures number 8112 from Stoney Creek, Inc. The pattern displays a quilt that represents the pieces of love that is in a family's heart. With Supplies: $29.95 We will ship you the printed design, 23 skeins of DMC Floss & Wichelt 14ct. 18" x 21" Aida (White) to complete your project.